After the success of the inaugural Women’s Big Bash League, our nation’s star-studded female cricketers are back in action. More games are now being broadcast in primetime on free to air as well as via a Facebook live stream, giving Australians more opportunities to witness the evolution of female cricket. The only uncertainty of the competition is which teams will rock and which teams will flop. The Strikers had the busiest pre-season out of all the teams, picking up Charlotte Edwards and Sarah Elliot. Edwards is an internationally recognised cricketer who has had a much-decorated career, amassing the most runs at the recent T20 World Cup in India. The powerhouse batter played for England in 23 tests, 191 ODIs and 95 T20Is, becoming the most capped international female cricket player in history. Sarah Elliot, on the other hand, is born and bred in Australia and is a huge scalp for the Strikers, as she was the captain of the Melbourne Renegades in season one. 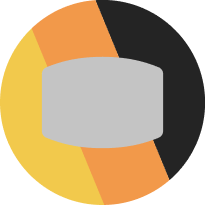 The all-rounder is a consistent contributor in whatever team and environment she plays in, therefore she will be vital to boosting the Striker’s chances in WBBL2. In addition to these superstars, Adelaide also boasts the services of Charlotte Edwards’ protégé, Tammy Beaumont, who was the second highest run scorer at the T20 World Cup. She is the first ever English woman to score consecutive centuries proving that she has the power to dominate against Australia’s finest young talent in the 2016/17 WBBL season. The brightest prospect of the young talent is Samantha Betts, a 20-year-old bowler who was awarded the ‘Adam Gilchrist Scholarship’ for being the best female cricketer under 21 years of age. In the off-season, she played county cricket in England, getting more experience in diverse environments under her belt in a bid to unleash her exquisite bowling in WBBL2. The Strikers finished seventh last year but have recruited the dynamic duo of Tammy Beaumont and Charlotte Edwards to significantly bolster their side. Beth Mooney is the key player of the Heat side, claiming the player of the season award for her roles in both the Brisbane Heat and Brisbane Fire. This earned her a call-up to Australia’s Southern Stars in February, where she was lucky enough to play in both the T20 format and the one-day format. The wicketkeeper has spent her off-season playing in England’s inaugural T20 super league competition, continuing to improve her immaculate form behind the stumps. The Heat also possess the talent of Deandra Dottin, a West Indian all-rounder who played for the Scorchers in WBBL1. She was a crucial member of the victorious West Indian T20 cricket team, claiming nine wickets in the series. But don’t let that fool you, as her batting has the potential to take the competition by storm. she was the first woman to hit a century at international level when she smashed a century off just 38 balls in 2010, a slogging which included five boundaries and nine sixes. Brisbane also signed Smitri Mandhana, to join the WBBL ranks. Mandhana has played 20 ODIs, 20 T20Is and two tests for India – experience which had selectors licking their lips. Like Dottin, she is a powerful hitter and if they have the opportunity to bat together, they will cause a lot of trouble for the other teams. Haidee Birkett is the emerging young talent in this team, due to being named the youth player of the year at the Queensland cricket awards dinner. She was also a premiership player in the Queensland Fire T20 squad in 2014-15, showing that she knows a thing or two about winning. The Heat’s chances won’t change much from their inaugural campaign. Unfortunately, their bowling stocks are short meaning that Southern Star, Holly Ferling will need to make heavy contributions to Brisbane’s bowling attack. In addition, their newest international recruits will need to find their feet rapidly in a bid to compete against the elite sides of WBBL2. All-rounder, Erin Burns will be looking to pick up from where she left off in WBBL1. A loyal member of the Tasmanian squad since its inception into the women’s competition, Burns has a wealth of experience under her belt and is a reliable player in the Hurricanes’ squad. Hobart also signed English vice-captain, Heather Knight. Since her debut in 2010, she has played 26 T20 games for her country and will play a key role in the Hurricanes’ aim to make amends for missing out on last year’s grand final. Julie Hunter, a former Southern Star is also a valuable recruit, as she was a part of the Southern Stars’ ‘three-peat’ World Cup wins in 2010, 2012 and 2014. Meg Phillips is another player to watch, an all-rounder who has an impressive fielding ability. She played cricket for Lancashire in England and was a part of the premiership-winning side of the T20 division 2 championships. 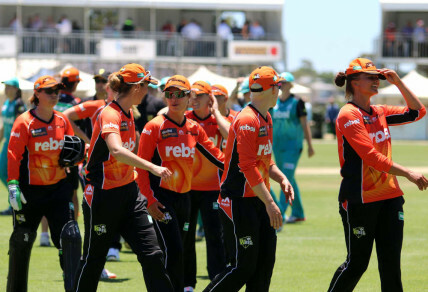 The Hurricanes were very unlucky to miss out on featuring in the grand final last year, however, with a quiet recruiting season and a shortage of international players, Hobart will find it much more difficult to experience the same success. The Renegades claimed the big scalp of Grace Harris, who spent WBBL1 in the teal colours of Brisbane. Harris is a member of the Australian Southern stars and has the capacity to be instrumental with both the bat and the ball, accumulating 287 runs and claiming 13 wickets in the inaugural season. She will have the opportunity to work with Rachel Priest, who has played 112 matches for New Zealand. Priest also became the first woman to hit a hundred in a domestic T20 match and had an impressive strike rate of 103.31 in WBBL1. The local talent of Sophie Molineux will be one to watch, as she was named player of the championships at the U18 nationals. She also led Victoria to their first Betty Butcher Shield in 12 years when she captained the U18 side. The Renegades still have a very young side and may struggle to compete with the experience that the other teams possess. Melbourne only recruited one player in the off-season and will need more than Grace Harris’ talent to bolster their chances in WBBL2. The Stars have arguably the best female cricketer in the country among their side. Meg Lanning is the world’s number one ODI player, with an outstanding average of 51.18. She was also last year’s player of the tournament, claiming the most runs out of any player (560), recording scores of 75 or above four times. Bowler, Gemma Triscari took a hat-trick against the Sydney Thunder last year and has been a vital member of the Australian Southern Stars. The Stars will be ecstatic to have the 2011-12 Zoe Goss medalist once again for WBBL2. The Stars definitely possess the fire power to go all the way. The side is perfectly balanced with Southern Stars players like Meg Lanning and Kristen Beams as well as up and coming players like Emma Kearney and Anna Lanning. The Scorchers had a very busy off-season, picking up Mathilda Carmichael, Piepa Cleary and Lauren Ebsary. Carmichael played hockey for four years and only narrowly missed out on selection for the Australian Hockeyroos. Cleary is a member of the Australian Shooting Stars squad, thanks to her consistency while playing for the Western Fury. The Scorchers also have another member of the Shooting Stars in their ranks in Heather Graham- a reliable all-rounder who made two half-centuries with the Western fury this season to complement her consistent line and length. However, their marquee player and their most important player will undoubtedly be Elyse Villani, a Southern Star who averages 29 in the 39 T20Is that she has played for Australia. The Scorchers have an illustrious array of talent in their side and have a perfect balance of young and old. Players like Villani will play a key role in mentoring and nurturing the emerging young stars of the Perth side in WBBL2. You just can’t speak highly enough of captain, Ellyse Perry. Her recent form with the Southern Stars has been outstanding as she’s made scores of 93*, 95, 69 and 56 in the ODI series against South Africa. Perry averages a whopping 48.66 in ODIs and complements this with a strike rate of 102.83 in T20Is. Perry’s bowling will be complemented by Marizanne Kapp, who had a stellar WBBL1 season and was ranked as high as number two in the world for her bowling. She is one of the most economical bowlers in the WBBL and will again play a key role in the Sixers’ bid to go all the way in the 2016/17 season. The Sixers haven’t recruited new players but still have a wealth of talent to push their luck in experiencing another finals berth. They finished second in WBBL1 and don’t look like making a dramatic change in WBBL2, with their solid consistency throughout the side. Alex Blackwell led the Thunder to a premiership last year thanks to her immense amount of experience and her reliability as a positive leader. The Thunder welcome Stefanie Daffara into the side- an all-rounder who earned lots of accolades as a youngster and who just keeps developing. Mikayla Hinkley also joins the lime green premiers- a member of the NSW breakers academy, she is an exciting young talent who captained the NSW U15 side in an undefeated season throughout 2014-15. In that same year, she was also named in the Australian talent squad. Sam Bates is another youngster on the rise. She debuted for the ACT meteors in 2011 and took 7 wickets, earning her a call-up to the Australian Shooting Stars, in which she claimed 2/30 off eight overs in a match against England’s academy side. Bates’ left-arm spin bowling will complement the pace of Rene Farrell and will provide support to Maisy Gibson’s spin bowling as well. It’s hard to see the Thunder backing off in WBBL2, due to their dangerous attack which features the explosive West Indian batswoman, Stafanie Taylor. 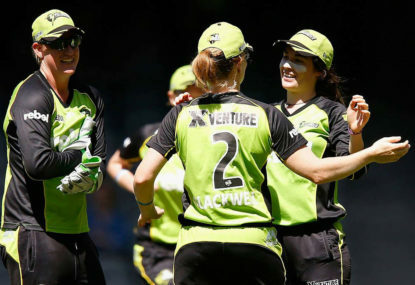 The lime green brigade have the best bowling attack with the competition including Erin Osborne, Rene Farrell, Maisy Gibson and Lauren Cheatle, who have all had experience playing for either the Australian Shooting or Southern Stars.